Over the weekend I had the privilege of being involved in a curriculum look-see with our local homeschooling support group. The planner for the event had contacted me a few months ago and asked if I would provide a table of materials for relationship homeschooling and if I would be available to chat with moms as they came through. What a blessing those few hours were to me, listening to so many moms who, more than anything, long to build loving and nurturing relationships with their children and to mentor and disciple them as they grow together in the Lord. • Kids with involved Christian parents have a better chance of becoming spiritually strong. • Life-on-life mentoring is so important in the home, school and church. • Small group programs with lots of committed adults are more successful in preparing spiritual champions than large meetings. • The lower the ratio of adults to kids, the stronger the likelihood of spiritual growth. Isn’t it interesting that the Bible has told us the very best way to raise children and now, thousands of years later, “research” has proven God’s instructions to be true? Doesn’t that inspire you today as you sit down with your family and share the Gospel message with your children, both in word and deed? As homeschooling moms, we are participating in the most fruitful and productive way to teach and guide the next generation of believers. It matters little what kind of curriculum you use, how much you spend on books and resources, or how many activities you provide for your children. What matters is that you give them your time and energy, your openness and transparency, your love and commitment. As you build relationships with your children, you are building the Kingdom of God, one cookie, one Lego at a time! Many of the lessons that I have learned along the path of homeschooling have been taught to me by my children. Can I say that the most important ones have actually come from them and they have often been the hardest ones to learn? This has been especially true when it comes to understanding what grace really looks like as we put it into practice. When we began homeschooling in the early 1980’s, we spent a few years in the Advanced Training Institute, Bill Gothard’s homeschooling program. One of the highlights, for me, of the annual ATI training conference was the mass choir made up of several thousand smiling students dressed in navy blue dress pants or skirts, crisp white shirts and blouses with navy blue ties and neck bows. It was a sight to behold as they sang “It will be worth it all when we see Jesus” my heart responding to the intended message “Hang in there, moms. One day you will see Jesus and all those years of giving your life to raising children will be worth it.” But there was something interesting you could observe about these young men and women if you had a trained eye. In that sea of navy and white uniformity, there would be imaginative touches in the accessories…flashes of other colors in the ties, neck bows with flair or shoes that made a fashion statement, hair styles that were just under the radar of acceptable conformity but obviously “toned down” for the week. For many years I “just knew” what was acceptable dress for homeschooled kids, my ideals being challenged as the artistic children among us grew older. Though each of the children are creative and artistic in their own ways, clearly three of them, 50% of my children, obviously march to the beat of a different drummer when it comes to personal style. My daughter was Anthropology nearly 10 years before there was Anthropology, which was often hard for me to understand in my personal, preppy, matchy-matchy life. Do you really think that red velvet jacket goes with EVERYTHING? What do you mean your hair is going to be purple? You’re covering your footstool with what? Faux fur? I just couldn’t get it. Then there is my youngest son who looks as though he dropped into Ned Nickerson’s argyle closet to do a little shopping before meeting Nancy Drew at the malt shop. Toss in just a touch of 1960’s Haight Ashbury paisley and you get the picture. Some of his peers might not approve but little old ladies love him because he looks like the dream boy from their own teen years. But it took the 4th born child to really show me what grace ought to look like as you stare it right in the face. The boy wanted a tattoo. I had read all the admonitions about tattoos being the sign of slavery. Sermons and articles in homeschooling publications that addressed teen rebellion always threw in a tattoo reference or two for good measure along with drug use and riotous living. Certainly the prodigal son MUST have spent some of daddy’s inheritance on a tattoo. So being a homeschooler with a tattoo did not compute. Clay told him that we didn’t really like the idea of a tattoo but that we wanted him to think about it for a while and to really consider the pros and cons before he got one and to do so in light of being a Christian. Visions of skulls and crossbones danced in my head. And then this son came home for a Christmas break from school and on his forearm there it was…not just a tattoo but one he had designed himself. When he showed it to us, he gave us the whole story. After our initial talk with him, he had gone to see his Old Testament professor to ask him about the teachings we had heard about tattoos. Together they examined all the Bible references and related verses. After considering the context of the passages and being sure that he would not be sinning by getting one, he drew his own design and went to a tattoo artist. As he explained it to me I found myself quite moved and ashamed of how judgmental I had been toward him. The drawing was of a face with a cross forming the nose and eyes in the center of the face and he explained that it represented the concept of imagio deo, being made in the image of Christ. He told us that it is a constant reminder in front of him of who he is in Christ and shared how he had been able to present the Gospel to several people who asked about its uniqueness. As I read these words, I realize how often I have been loath to extend grace to my children and have allowed my own tastes and opinions to be presented to them as a holy standard, when the truth is that God’s Word is the standard we ought to be pointing toward. How often I have even been tempted to put my own spin on Scripture in order to “prove” that my preference is the “right” one. And I have remembered the times when my first thought was “what would other people think about me, especially as a homeschooling mom, if my kid does x, y, or z.” It has caused me to repent of my own sin of loving myself more than I have loved God or my children. But here is the wonderful truth of discovering grace in parenting as found in 1 John 1:9: “If we confess our sins, He is faithful and just to forgive us our sins and to cleanse us from all unrighteousness.” Praise God, “all” includes those times when we have failed to extend the same grace to our precious children that the Lord has extended to us! This week, as I have studied through the book of 2 Timothy, I have been considering the difference between instruction and exhortation. Paul, as the older, spiritual father to Timothy, has many words of wisdom for the younger man and shares his concerns, admonitions, and warnings. In some instances he states directly what he expects Timothy to do. In other verses he encourages Timothy to make wise decisions that come from an inward depth of character as he goes about fulfilling his role as the young pastor. As I have looked at this passage of Scripture, I believe Paul’s relationship with Timothy and his methods of mentoring are a good example for parenting as we seek to exhort and instruct our own children. I also think that one of the secrets of parenting our children by grace is to understand the difference between the two, particularly as we help them embrace their purpose in life as well as the individual callings the Lord gives to them. From the very earliest days of toddlerhood, we must instill in our children the truth that they are created for one purpose alone, to bring glory to God. The children’s catechism states so sweetly “Who made you? God made me. What else did God make? God made me and all things. Why did God make you and all things? For His own glory.” These words should be on the lips of little ones early and often. We take them through the pages of the Old Testament, introducing them to the heroes of the faith who were committed to bringing glory to God, not omitting their failures but rather instructing our children in God’s grace and mercy. And as we do this, how important it is to share with them our own failures and struggles along our own faith journey. As we spend time with them reading the Gospels and the Epistles of the New Testament, we can begin to lead them into a deeper understanding of discipleship and what it means for them to love God and their neighbors, how their choices in life will reflects their one purpose of glorifying God. Instructing your children that their purpose is to spend their lives glorifying God is the first half of two sides of the coin. Tomorrow I will talk about the other side, that of exhorting our children as they discover their individual callings from the Lord. When we think of exhortation, probably all of these characteristics come to mind. How important it is for mom to set the tone, give the orders, cheering both up close and from a distance, and to keep things running as per the rules. It is interesting that the word exhort in the Biblical sense embodies all of these tasks and I believe it is one of the most important acts that a mom must do on a daily basis, especially as we prepare our children for the future. The Greek word for exhort is “parakaleo” and is found 16 times in the New Testament, the only word translated as such. It comes from two root words, “para” and “kaleo.” “Para” means close proximity, joined, alongside of and suggests encouraging both by strengthening and comforting. “Kaleo” which means “to call” is the same word used by Christ to call certain ones to be his disciples and also to invite people by the preaching of the Gospel. The word given to the Holy Spirit, “paraclete” means one who consoles, one who intercedes on our behalf, a comforter or an advocate (an attorney) and comes from the same root words. 1. We need to exhort our children, helping them understand that there is no such thing as a secular calling. All callings from the Lord are sacred, no matter what field of study or work they do. I love the story Os Guiness tells about his great great grandmother. Widowed at a young age and overwhelmed with her responsibilities of caring for little ones, she decided she was going to jump off of a bridge into the fast moving current of the river below. As she stood at the railing’s edge, she looked up and happened to see a farm boy plowing his field into meticulous rows, each one in perfect parallel to the one before. As she watched him, mesmerized by his work, it occurred to her that if this young man could take such care and pride in such a simple task, she could certainly do the same in the important job of raising her children. She left the bridge and eventually remarried a man who would later become the great great grandfather of Os Guiness. Though the farmer never knew it, his work was, indeed, a sacred act. 2. As parents, we are the first to recognize the natural gifts and abilities that the Lord has given to our children and our encouragement of those gifts can grow into a lifelong pursuit of study and learning. When our daughter was quite young, she became fascinated with the piano in my parent’s home. 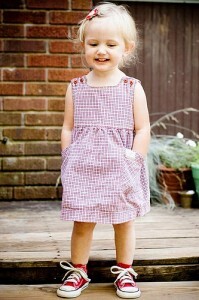 She would often make a beeline for the piano at church and pulled herself up on the piano bench to play. When she was old enough for piano lessons we bought a piano and from the very first days never had to remind her to practice. As her pieces became more difficult to learn, she would sometimes have weeks of discouragement when challenging passages challenged her to tears. My husband always seemed to recognize those times and would stop at a music store after work to bring home a new CD that he knew she would enjoy. Without fail, his small gesture of encouragement made all the difference to her and communicated in a very tangible way that he believed in her gifts. 3. We can exhort our children best when we learn their love languages and use them to comfort and inspire them. Coming alongside our children and spending lots of time with them, we learn to know which ways we can best express our love to them. The same is true when it comes to exhorting our children. Gary Chapman, in his famous Love Language books, describes the five ways we can communicate love to our kids: words of affirmation, quality time, receiving gifts, acts of service, and physical touch. When we see an area of life where our children are struggling, discussing it with them and working through it alongside of them can be accompanied by their love language, making the impact of our efforts much more effective. Perhaps your son is struggling with the desire to be involved in sports but is also at an awkward stage of physical development. If his love language is receiving gifts, maybe a DVD the shows the special techniques used by his favorite professional athlete would encourage him. If he responds to physical touch, giving him a back rub as he shares his struggles with you conveys to him your comfort and care of him. 4. We must be careful to never superimpose our own desires and preferences for their callings in life on our children, instead trusting that the Lord has a very special plan for each child and that it doesn’t have to reflect or be the same as ours. One of the most insidious teachings that is coming out of the patriocentric movement within homeschooling circles today is Doug Phillips’ and Geoff Botkin’s 200 year plan. Rather than encouraging young people to seek the Lord and to fulfill God’s calling in their lives, young people are taught that they are created to fulfill their fathers’ callings, ones that are predetermined for them, presumably the very ones Geoff Botkin has outlined for them. In contrast to this, while I agree that God does call out and work through families, each of us is accountable before the Lord for fulfilling the callings God gives to us as individuals. Luke 12:48 exhorts us that “unto whomsoever much is given, of him shall be much required.” Those of us who have been given the awesome responsibility of parenthood would do well to remember that much will be required of us as it will be of our children to whom this verse is also written. 5. We should exhort our children by word and deed that their callings are not for their own profit but are both for the good of their neighbor and for the glory of God. It is so tempting to glory in the successes of our homeschooled children. There are typically many in which to be proud and our children need to know that we ARE proud of them. But more importantly, they need to understand that God does not give them abilities and gifts nor does He call them into His service in order to benefit them personally. Their callings are to bring God alone glory and they are to bless others so that the testimonies of the Lord may be known. In his book The Call, Finding and Fulfilling the Central Purpose of Your Life, Os Guiness asks these questions: “Do you want the best and most wonderful gifts God has given you to decay, spent on your own self? Or do you want them to be set free to come into their own as you link your profoundest abilities with your neighbor’s need and the glory of God?” As parents, we should be asking those questions and coming alongside our children as they seek to answer them by God’s grace. 6. The sense of personal calling on the lives of our children will keep them going during those times of discouragement and difficulty that are certain to come to them and we would do well to prepare them for those times and to come alongside them during them. Early on our children must embrace the truth that God has no plan B for their lives, only a plan A, and that He is bringing that plan to pass in spite of our best efforts or worst mistakes. Sometimes our children sin miserably and, lost in our own grief and disappointment, we forget this truth ourselves. But it is during these very times that we need to fulfill the calling God gave to us as parents to comfort, exhort, admonish, strengthen, and encourage our children, affirming God’s forgiveness and watch care. I love reading the story of Jonah, of his refusal to obey the Lord, his recognition that he was in the belly of the fish, the biggest mess of his life, because of his disobedience and that it was God who placed him there. In the second chapter he cries out to the Lord for mercy and deliverance and then makes this profound statement: “Those who cling to worthless idols forfeit the grace that could be theirs.” How well Jonah summed up the loss experienced by following other life plans than the one God has for each believer. If our children fail and try to run away from the Lord by sinning against God through disobedience, especially by following a call He has not placed on their lives, they need to know that God may use amazing and painful ways to bring them back to him. They need to understand that God is also a merciful and gracious God who is swift to forgive. We should do likewise. I once worked with a woman who made many decisions that ended up costing the organization either loss of credibility or finances. Repeatedly she would invest her time or resources into products or services that ended up being much less than she hoped for. But rather than admit that she had messed up and seeking to correct the problem, her usual response was to try to justify her choices by trying to make them work for her. Her actions frustrated everyone, including herself, and eventually, after losing many employees, she moved on as well, though I doubt she ever understood the root of her problem. We have all been there. We have purchased the car that turned out to be a gas-guzzling lemon but “insist” it is the perfect car for us. We buy cute shoes that never fit properly and don’t match a thing in the closet and never will because they are yellow, but we don’t get rid of them, insisting we will find the perfect dress one day. As homeschoolers, we have subscribed to homeschooling materials that just didn’t work for our own children or have joined groups that didn’t meet our goals for a particular child, the result being that we either continued on so as not to feel like we had invested wrongly or we count our loses and move on. When it comes to relating to people, though, this approach does not work. We can buy a new car, give shoes to Goodwill, and sell homeschooling materials on half.com but with human beings we are bound to correct the problems. Only by God’s grace can we do this by repenting of our behaviors, seeking forgiveness for our actions, and addressing the pride issues that keep us going in the wrong direction. Researcher George Barna’s study on teenagers reveals many truths that moms need to understand. In interviewing young people from assorted backgrounds, he found that 75% of them felt that they were very close to their mothers and that as many gave her an “A” in parenting. In fact, less than 6% gave mom a “C” or lower on the mom final! However, the high grades do not reflect everything about their relationships and over 30% of them thought there were things they would like to have changed but didn’t entertain the idea of doing so because they didn’t ever see their moms changing! In pondering why this is, especially when it comes to Christian homeschooling moms, I think we have besetting sins that drive our attitudes and that keep us from change. Sometimes those sins are part of the baggage we brought into our homeschooling journey. Sometimes they come about through the lack of discernment when it comes to approaching the Word of God. 2 Timothy 3:16 assures us that not only is the Word of God able to show us all we need for life and godliness, but it tells us the steps to take to accomplish it. 1. Great parents are highly engaged with their children. They are there for their kids, emotionally, physically, intellectually, and spiritually. Deuteronomy 6, the proverbial homeschooler verse, tells us both what we are to share with our children and how to do it: “Hear, O Israel: The Lord our God, the Lord is one. Love the Lord your God with all your heart and with all your soul and with all your strength. These commandments that I give you today are to be upon your hearts. Impress them on your children. Talk about them when you sit at home and when you walk along the road, when you lie down and when you get up. Tie them as symbols on your hands and bind them on your foreheads. Write them on the doorframes of your houses and on your gates.” In other words, we are to be engaged 24/7 and are to seize every opportunity to make an impact in their lives for eternity. 2. Great parents spend lots and lots of time with their children. Sometimes I am amazed at how busy families are and at how divided family members are from each other. 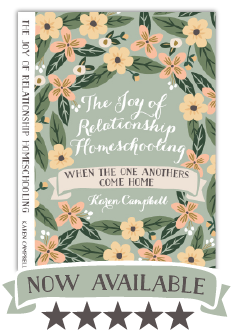 Between church activities, sports, enrichment groups, co-ops, and lessons of all kinds, sadly, homeschooling families often spend little time with each other outside of schoolwork. 3. Great parents are those who are willing to listen. This begins when little children point at everything, wanting to know what it is. It continues with answering infinite numbers of questions during the day, questions there are sometime no answers for. And as they grow older and the questions become more complex, many times children process and think out loud, not really expecting an answer but wanting to see your reaction. 4. Great parents are ones who can balance their ability to be vulnerable and soft with the need to be the proper authority in their lives, ones who can deliver the hard messages of life without crushing the spirit. One of the things I have so appreciated about our pastor is his ability to present the hard truth of the Word of God in such a manner that at the end of his sermon, you find yourself desiring to do the right thing, to submit to the Lord because you love Him, rather than feeling beaten into compliance. It has served as a lesson to me with my own children. This series is also featured in Come Weary Moms’ recent blog carnival. Be sure to checkout the other articles!